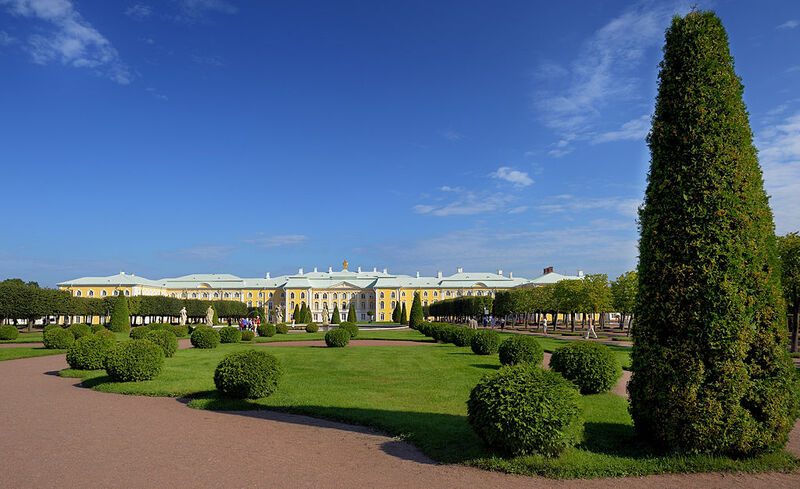 Peterhof is one of the most beautiful suburbs of Saint-Petersburg located on the coast of the Gulf of Finland. 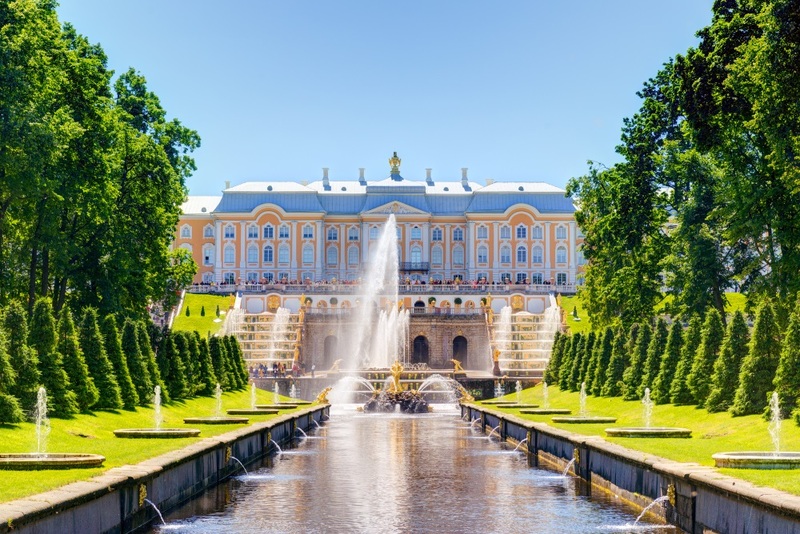 The city of Peterhof began with an ensemble of palaces and parks which Emperor Peter I decided to build to overshadow the famous French Versailles. 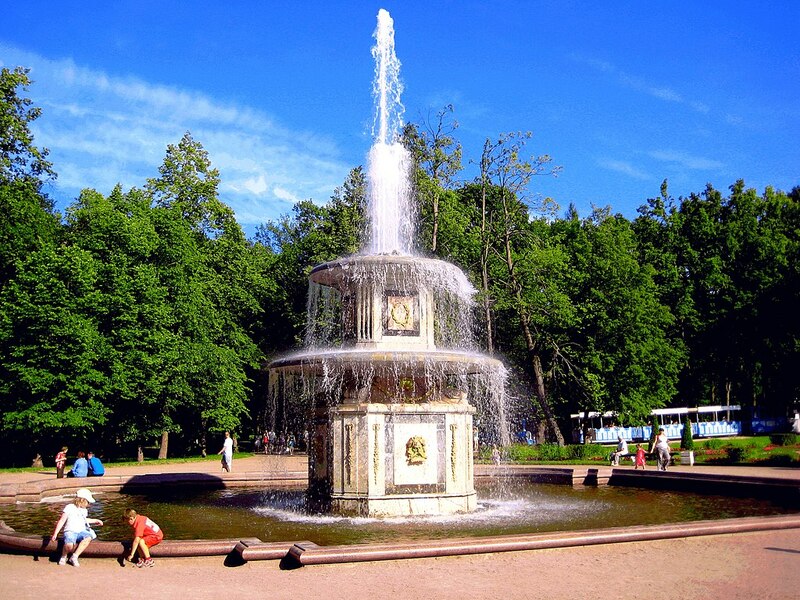 Peterhof has one of the world’s largest fountain systems – 147 active fountains. Together with a number of other monuments of Saint-Petersburg, Peterhof forms a unified UNESCO World Heritage Site. Each year, Peterhof is visited by 4.5 million people. The name Peterhof comes from German and means “the court of Peter”. Peterhof was founded by Peter I at the very beginning of the 18th century and became one of the most luxurious summer royal residences and a symbol of Russia’s conquest of access to the Baltic Sea. The French architect Jean-Baptiste Alexander Leblon was appointed by Peter as General-architect. 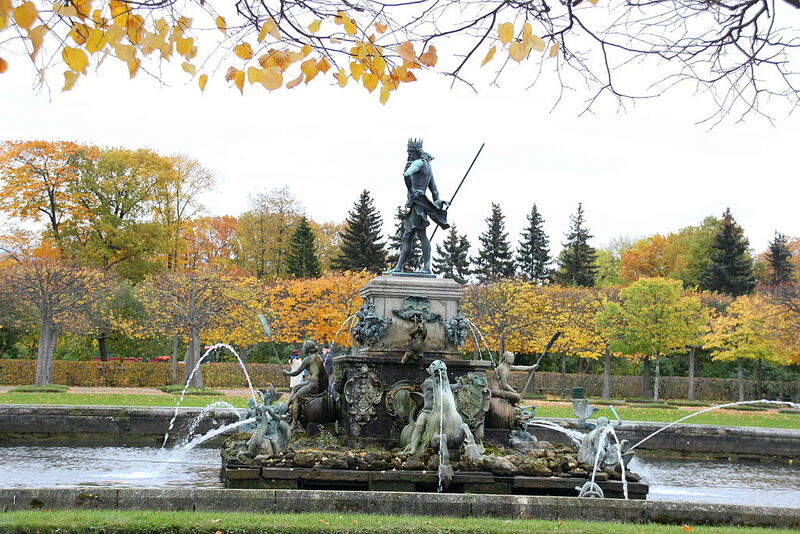 The Italians, such as Bartolomeo Carlo de Rastrelli, Niccolo Michetti, the “fountain masters” Venetians Giovanni and Giuliano Barattini, made a huge contribution to the design of Peterhof. 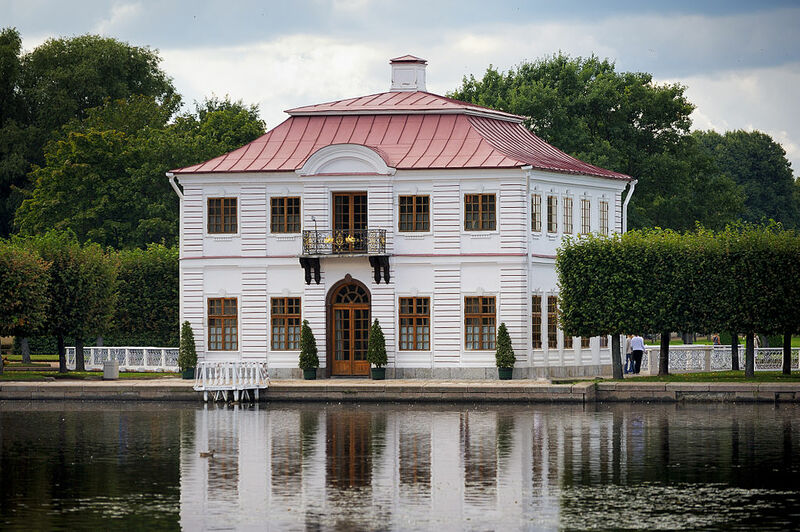 Prussian, Austrian, Dutch, Russian masters also worked in Peterhof. 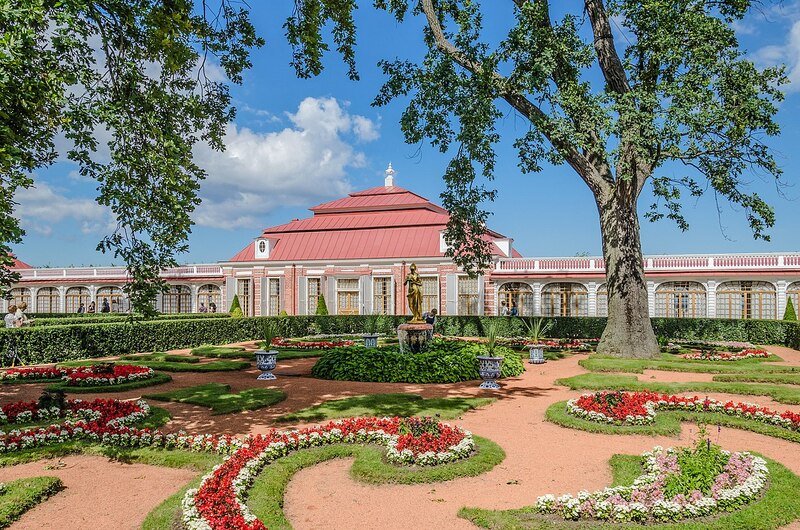 Under the Empress Elizabeth Petrovna (1709-1762) Peterhof saw its revival. The works at that time were carried out under the direction of Bartolomeo Francesco Rastrelli (the son of Rastrelli who worked under Peter). The residences were redesigned, Upper Garden was completed, and additional buildings were erected. Rastrelli’s talent turned Petergof into a solemn baroque ensemble. After the October Revolution of 1917, the palaces were turned into museums. From September 1941 to January 1944 the city was occupied by German troops. As a result of hostilities, the city was almost completely destroyed or burned. About 30 thousand objects of painting, arts and crafts, and sculptures from the palace collections were destroyed or looted. Fountains and water supply system were disabled. More than one third of the whole amount of trees in the ensemble (about 10 thousand) were cut down. In 1944, Peterhof was renamed to Petrodvorets, as the German name was too hard to perceive against the background of the destruction left by the German army. In the same year, the restoration of the city, its palaces, parks, and the fountain system had began. The scale of destruction was so great that not all objects could be restored. Works on some objects are carried on to this day. In 1997, the city got back its original name. It was not by chance that Peter chose this particular area for the construction of fountains: several reservoirs fed by springs from under the ground were found here. 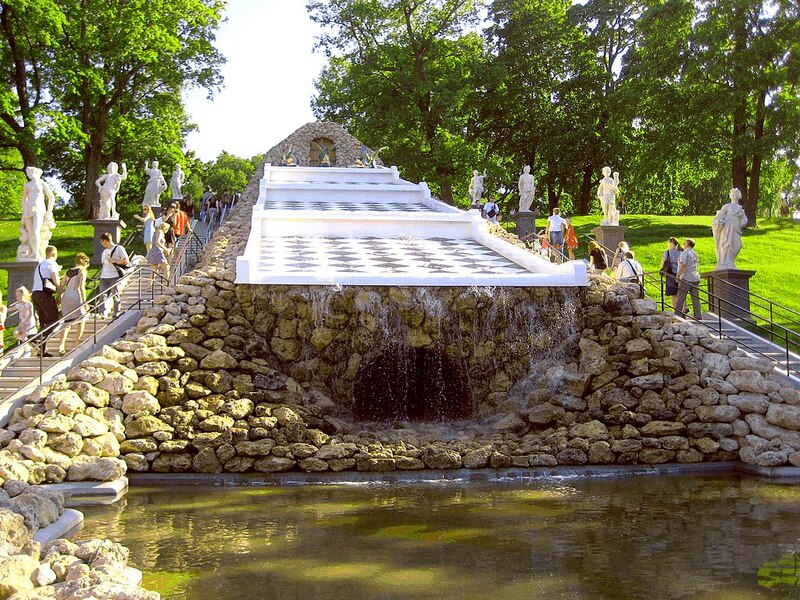 To supply the fountains of Peterhof, a special water pipeline was built with a total length of 40 km. On its route there are 18 storage ponds with more than 1.3 million cubic meters of water and occupying an area of almost 100 hectares. In addition, for nearly 300 years, the fountain water conduit has served as a source of drinking water for the population of the city. 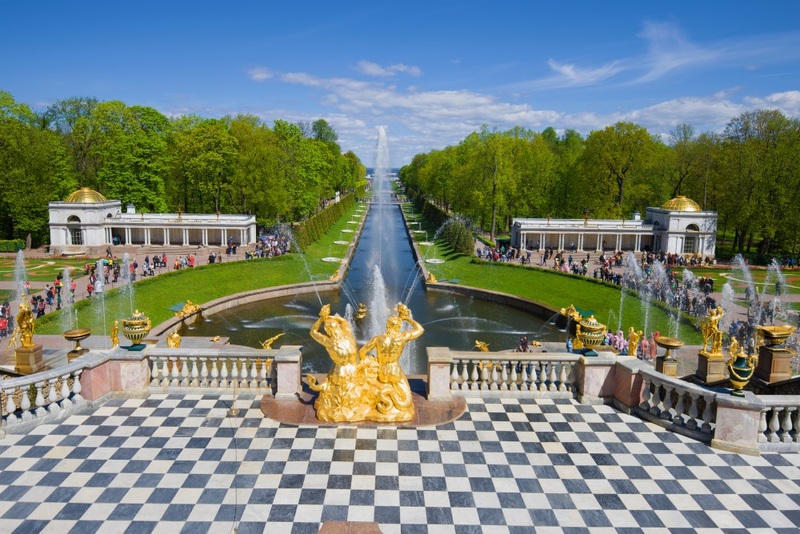 Peterhof Park is a unified composition in which the palaces, fountains and green alleys are combined together. The composition includes the Upper Garden, the Lower Park, as well as the Peterhof palaces – Grand Palace, Monplaisir and Marly. The overall concept of parks and palaces planning was developed by Peter himself. 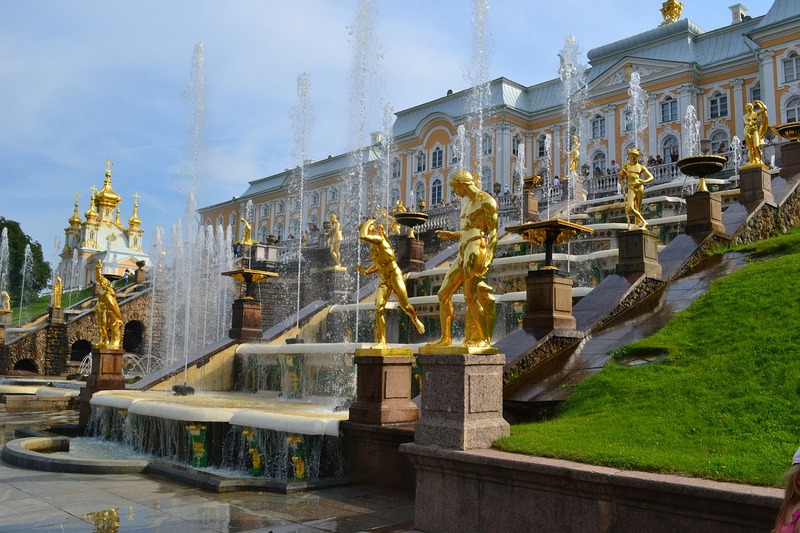 Within one article, it is impossible even to briefly describe all the sights of Peterhof. Therefore, here we list the most prominent of them. A beautiful panorama opens on Peterhof from the sea. On the edge of the natural 16-meter terrace is the Grand Palace, in front of which the Grand Cascade is sparkling with gold. 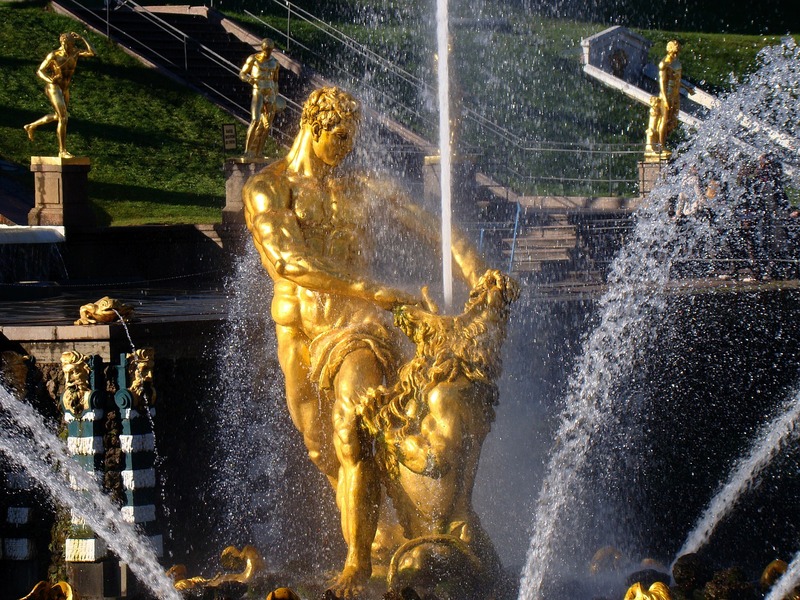 In front of the cascade, the most powerful jet of the fountain “Samson tearing the lion’s mouth” soars upward. According to the original plan, the figure of Hercules conquering the Lernaean hydra was supposed to be in the center of the Grand Cascade. It is believed that the figure of Samson appeared in connection with the Poltava victory of the Russian troops over the Swedes which happened on the day of Sampson the Wonnie. The lion is associated with Sweden since this symbol is present on the country’s emblem to the present day. From the Grand Cascade to the sea leads the Sea Channel. The channel divides the Lower Park into two parts – “Western” and “Eastern”. Sea Channel, view from the Palace. 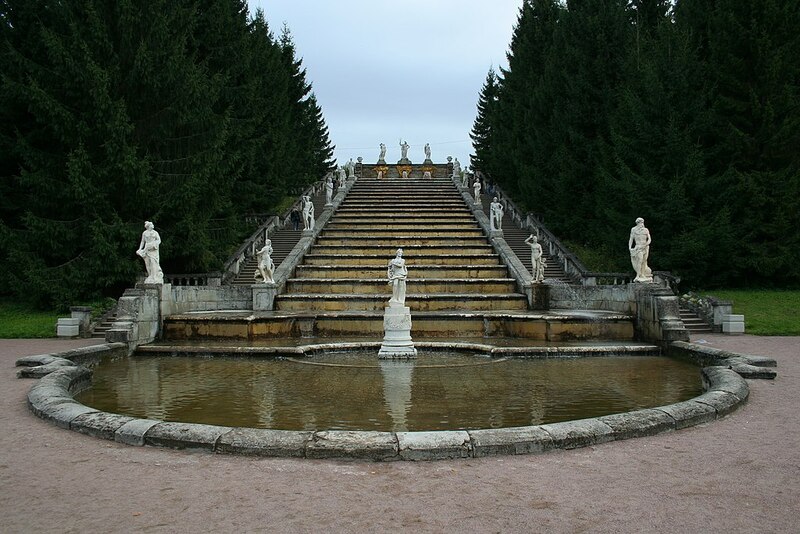 Among other sightseeings, in the Eastern part are: Monplaisir Palace, the cascade “Chess Mountain”, “Roman Fountains”, and “trick fountains” that unexpectedly splash the visitors. 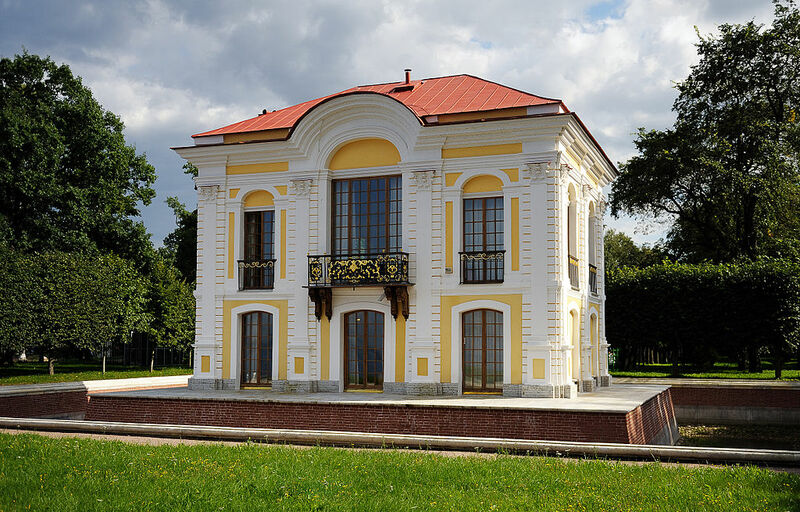 Monplaisir was the favorite palace of Peter the Great – the interior and exterior of the palace are distinguished by rigor and rationality. After the death of Peter I, the palace turned into a kind of museum dedicated to the emperor – nothing changed here after his death. Presently, the first in Russia collection of paintings by European artists of the 17th-18th centuries is represented in Monplaisir (the paintings were purchased by the emperor himself). Monplaisir Palace and garden. Source: Wikipedia. Cascade Chess Mountain. Source: Wikipedia. The Roman Fountains are called Roman as their appearance is copied from two fountains installed in Rome, on the square in front of St. Peter’s Cathedral. The height of the fountains is over 10 meters. One of the Roman fountains.. Source: Wikipedia. 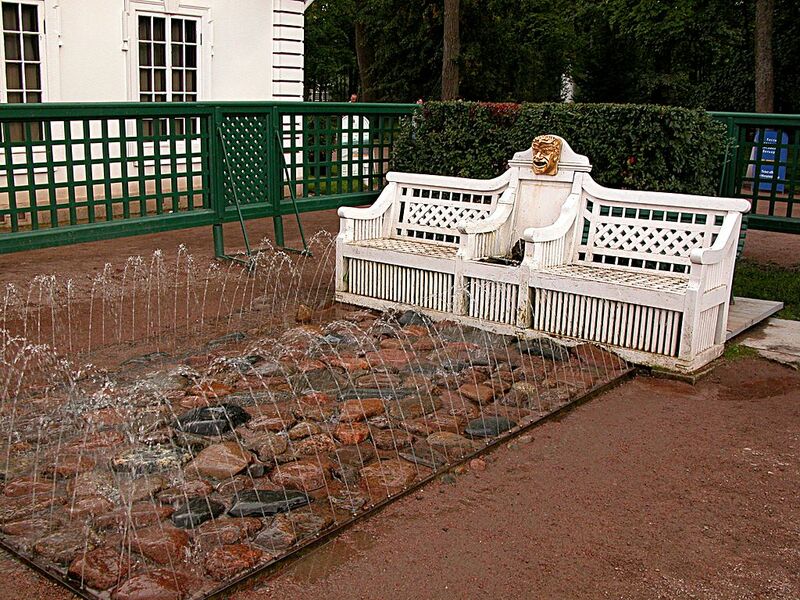 Trick fountain “Divanchiki” (“little benches”) is the oldest of all the trick fountains of Peterhof, created in 1721-1723. It is believed that the Peter I himself was working on the draft of the fountain. Trick fountain Divanchiki in Monplaisir Garden. Source: Wikipedia. In the western part of the Lower Park there are the Hermitage Pavilion, the Marly Palace, and the “Golden Mountain” cascade. The Hermitage Pavilion in the Lower park. Source: Wikipedia. The “Golden Mountain” cascade cascade is named so because the vertical part of the cascade steps is trimmed with gilded copper sheet. If you look at the cascade from below, standing at the foot, you get the impression of a flowing golden stream. It is located near the Marly Palace. The cascade Golden Mountain. Source: Wikipedia. The Marly Palace was named after the residence of the French king Louis XIV in Marly-le-Roi near Paris, which Peter the Great visited during his stay in France in 1717, and was intended to be inhabited by noble people. But already in the middle of the 18th century, it was turned into a sort of repository of objects associated with the name of Peter the Great. The Marly Palace in the Lower park. Source: Wikipedia. The Upper Garden, with an area of 15 hectares, was laid out under Peter I. Peter, known for his practical approach to everything, used the garden to grow vegetables. The Upper Garden acquired its modern look only by the second half of the 18th century. Fountain Neptune in the Upper Garden. Source: Wikipedia. In the eastern part of the Lower Park there is a fountain “Pyramid”, especially striking in its high-water and amazing pattern. From a distance, it resembles a triumphal structure. Peter the Great drew the idea for this fountain from his trip to France, where he saw a water cannon in the form of a triangular obelisk. Fountain Pyramid in the Lower Park. Source: Wikipedia. 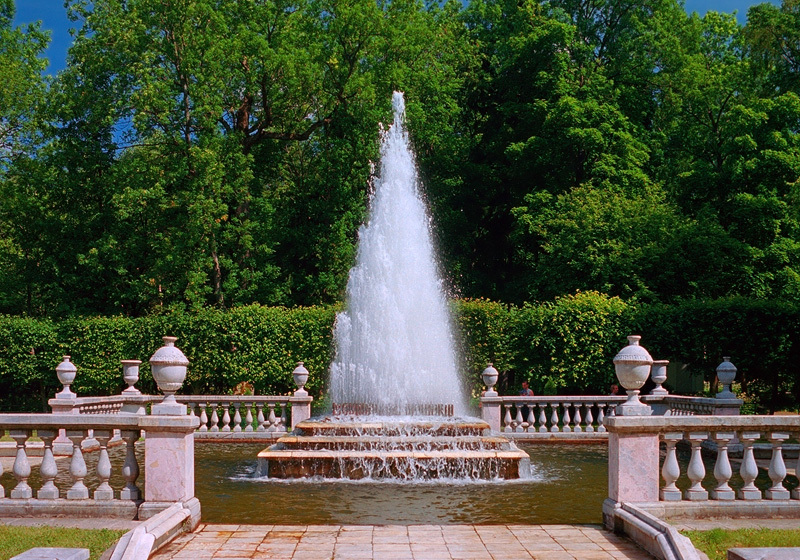 We have showed you just a tiny part of all the beautiful spots and fountains you can find in Peterhof. When you come to Saint-Petersburg, don’t forget to visit this city of fountains so you can see everything yourself, take gorgeous pictures, and get splashed by the trick fountains. Keep in mind, that the fountains work only in the summer season.